As a mom, it is hard to find educational games that the boys truly want to play! I think it is so important to limit my boy’s screen time. When we can’t go to the park or exercise outdoors, we find ways to entertain ourselves at home. 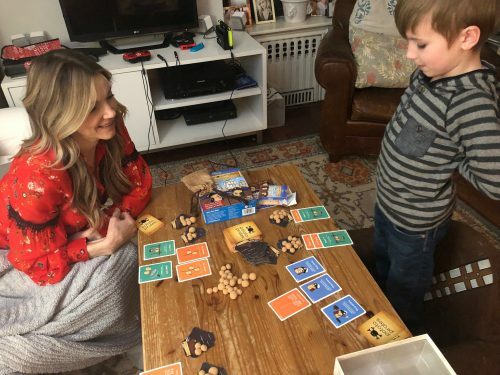 Boardgames have always been my favorite and I have fond memories as a little girl playing board games with my family. ThinkFun creates awesome educational, interactive, enjoyable games. I love finding educational games that really are fun. My boys learn to count, strategize, brainstorm and be creative when we play ThinkFun games. I absolutely love the vibrant game pieces ThinkFun created! It is so nice to find children games that are beneficial to their overall physical health and brain development. Nothing is better than being able to entertain my boys with this kind of fun while they are also learning. The games were a huge hit with me right off the bat because it encouraged off-screen learning and participation. With the amount of technology out there, old school toys like Legos, Hot Wheels, and Polly Pockets are all historic thoughts. ThinkFun created the perfect balance between fun and learning. Their creations make the boys want to play the games. Timothy constantly asks us to play Potato Pirates his new favorite game. The twins absolutely adore the Roll & Play dice soft dice, it’s truly the perfect first “board game” for kids. I may be biased as a yoga teacher; but Yoga Dice has to be one of my favorite kid games ever! The game comes with 6, six-sided poses on dice. When they’re rolled the number landed on must be done for the length of the breaths on the other die. This cute and fun yoga game introduces the benefits of the yoga practice at a young age. Every game is fun for kids when you add dice, even math! I love how these math dice help me be a very proactive part of my Timothy’s education. As he rolls the dice he has to figure out the equation of subtraction, addition, multiplication, and division in different ways. I’m blown away by how smart he is for his little age! This puzzle is so much fun! Besides having the fun putty to play with and stretch, kids are challenged to get from point A to B with the same color putty and not letting other colors cross paths. I’ve played apps like this on my phone before. Think Fun Putty Puzzle brings those kind of games to real life. The game simplifies it for children while adding levels to encourage their learning, this was one is a huge hit with Timothy! I used to love Clue and Monopoly and all those board games when I was younger. When I saw Potato Pirates on the ThinkFun website, I had to order it immediately! Potato Pirates is so goofy and fun for my husband, Timothy and me to play. He’s secretly learning how to code while creating strategies for sinking other ships and collecting potatoes. I have to admit being from Idaho makes this one even more fun for me! The twins are too young for this game right now; but they do love trying to steal our potatoes. My boys and I love all the ThinkFun games! 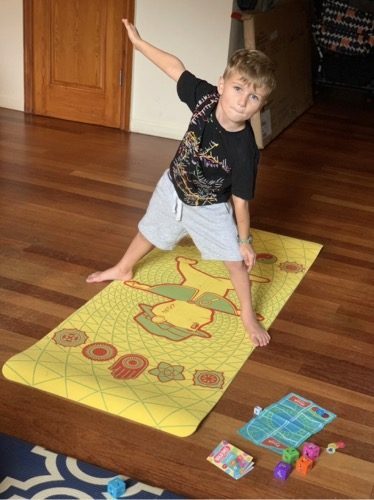 I think it is especially important to encourage physical activity in kids; and I love that they found a way to introduce yoga at such a young age. All the games focus on making your kids think while they have fun, it’s really a cool brand. ThinkFun brings back traditional game playing instead of onscreen YouTube and Apps which is so important to me. I’m not opposed to technology; but I like a healthy balance. It’s magical to watch my boys get absorbed in educational games; and for us all to play together as opposed to each one on an IPad. The ThinkFun brand is officially mama approved by me!